Retie, Tuesday 23 October 2018 – Belgium is famous for its many festivals and the logistical suppliers that it takes to organise them. From the builders of monumental stages, to sound and light specialists, down to the smallest details, such as the drink tokens. This is the niche in which the Belgian company b-token leads the global market. But their (personalised) tokens find applications far beyond the festival grounds as well. The tokens are used for all kinds of unexpected applications, ranging from boardgames to business cards… you name it. Currently, the majority of b-token products are made from plastic. As market leader, the Retie-based company wants to change this, and is therefore always on the lookout for more sustainable and ecological alternatives. In addition to wood and even potato peelings as basic raw materials, b-token is now announcing a brand-new, innovative token: the Ocean Token. These are made using old fishing nets as raw material, nets that would otherwise all too often wind up at the bottom of our oceans and seas. The result: a token that gives a second life to one of the world’s primary sources of ocean pollution. The Belgian company b-token, the worldwide market leader in the field of tokens, manufactures tokens in all different colours, sizes and materials. “Currently, 70% of all of our tokens at b-token, are still made from non-recycled plastic. Since we are the worldwide market leader in the sector, we consider it our duty to constantly look for sustainable alternatives and, if necessary, to develop them ourselves. Our aim is to ultimately be able to make 100% of our tokens from sustainable raw materials, and to see our competitors follow our example,” says Nathalie Breugelmans, CEO of b-token. “That’s why we are now proud to present the new Ocean Token, made from recycled fishing nets”. It is estimated that worldwide, there are some 640,000 tonnes of old or lost fishing nets resting on the bottom of our oceans and seas. This accounts for a full 10% of the total plastic soup*. The Danish company Plastix Global developed collection points in Scandinavian ports where fishermen can dispose of their used fishing nets. The fishing nets that are collected are recycled into raw plastic granules, which are then used by b-token as the raw material for the ‘Ocean Token’. It is important for the nets to be collected before they wind up in the water. Fishing nets that have been in contact with seawater for too long start to deteriorate due to the salt and soon become unusable for recycling into raw material. So far, in Belgium there has not yet been an initiative like the one in Denmark, where fishermen can dispose of their worn out fishing nets free of charge at collection points in the ports. But that doesn’t mean that we are not taking action in Belgium. The non-profit Ecoduikers (‘eco-divers’) is dedicated to removing old fishing nets from the North Sea. This is a great initiative that b-token is plroud to support by donating 10% of the proceeds from the Ocean Token to them. “We are team of experienced divers who are committed to recovering as many old fishing nets from the North Sea as possible. In doing this, we are pleased to be able to count on the support of b-token in our fight against the plastic soup that we encounter every day. 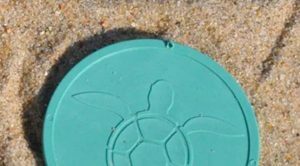 In the future, we want to see our ocean plastic-free and that is the goal that we are working towards together,” says Roel Van Bouwel of the non-profit Ecoduikers. In an ideal world, fishing nets would not end up in the oceans, but would be immediately recycled into new raw materials.